The martial world holds many competitions steeped in tradition and honour ,but none so mysterious or prestigious as the DOJO KUN. Few dojos are selected to compete, but all hold the sacred "Rules of the Training Hall! as their own DOJO KUN. Only the most dedicated students and senseis shall prevail! DOJO KUN means "DOJO RULES" and is a set of principles that guide the physical and spiritual development of marital arts practitioners. 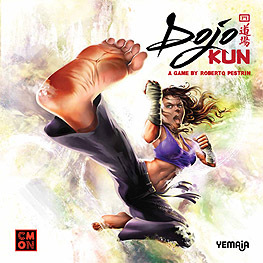 DOJO KUN is a strategic game in which every payer heads one of the 4 Dojos (Earth, Fire, Water, and Wind) and their goal is to train athletes, buy new training equipment, expand their dojo, find adventures, and lead their athletes to victory in this renowned martial arts tournament!